1.i made the mesh and texture and anims with mm3d. Its rigid and doesnt move in game. Prob 2...It loads one or the other...how do i get both at same time on same scene? You can load data from one blender file to another using the append/link function (shift + f1). EDIT: And the tags problem...how do u make tags move depending on frame? I go thru anims and im just moving its place,because when i go back a frame its in same place. Forget about plans and everything...i decided...use erebus.blend or any other skeleton animated model for the anims. At risk of hijacking the thread I've been trying to get the IQM exporter to work and need some help with the textures. I'm confused about how textures/materials in blender relate to the texture/shader in Xonotic. In my blender file the textures are in the same folder and the materials are named crap like Model001_Material001. I know there is a naming convention for xonotic textures somewhere on the forum. I'll have to fnd that. Quote: I know there is a naming convention for xonotic textures somewhere on the forum. I'll have to fnd that. Wish I could help but I've never been able to export to IQM using anything else than an older version of Blender. 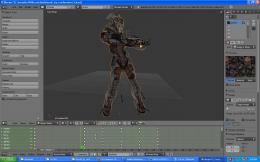 All the current models were animated in and exported from Blender 2.49b. If you haven't made changes to the animations you might be able to use Blender 2.49 to append your model to the Erebus armature and export from there and it might work without any tweaking of the model or animations. At least, it's worth a try. do i have to enable it somwhere? and how? If you put the 2.49b version of iqm-export.py in .blender/scripts and it should show up in the menu, I don't remember having to enable it, it should be there automatically.